After I finished my Autumn sorceress gown, I began working on designs for a winter version. I knew I wanted fur and heavier looking fabric. After a few drafts (and with some inspiration from old illustrations of St. Nick), I came up with this design. I wanted it to feel lavish, but also warm. Like the other dresses in the Sorceress Gowns Project colors really mattered. Initially, I wanted to make her fur trimmed coat red, but that felt a little to Father Christmas for me. So, instead I chose colors that reminded me of my visit to Alaska in November. Blues and greys that evoked the cool peacefulness of a winter day. I wanted some big statement jewelry for her to really stand out against the turtle neck of her dress. So, I had fun designing that big gold bib necklace. For her magical staff, I wanted snowflakes and the north star. I also added a ski poll like pointy bottom for hiking through the snow and being safe while doing so. I couldn’t decide between gold and silver for the colors of the staff, so I used both. Her boots are fur trimmed. The soles are meant to reflect ice skates. I also had a lot of debate about what color to make her stand. I almost made it white, but then I felt like it looked “unfinished” somehow, so blue won. When I think of spring I think of crocuses. Perhaps, because I grew up in a snowy place. I think of their little flower heads poking out through the melting snow, seeking light and warmth. So, when I set out to draw a Spring inspired Sorceress gown, I knew crocuses were going to be featured. Beyond the crocus, I knew I wanted drape and layers. I wanted something that was soft and warm, the way I think of spring sun as being soft and warm. The pattern on the dress is meant to invoke the melting snow. The white dripping down and off the grass and the slow emergence of color again. I love winter. I love the stillness and the peacefulness, but spring is a time of transformation. Color wise, I returned to the crocus. I wanted greens and purples and rich yellow. I wanted things that were soft and sweet, but also vibrant. Spring is not peaceful to me (unlike winter). Her corset features a crocus, of course, and so does her staff. So, today’s two Sorceress Gowns Project paper doll dresses were about two very different seasons. I am deeply proud of both gowns, though there is a lot of diversity in them. What do you think of today’s gowns? Do you have a favorite? Let me know in a comment. So, I’ve been drawing Bodacious and Buxom paper dolls since 2013 (which sorta surprised me when I did the math) and I’ve never done a fairy version. And then I was like, oh, I don’t have any. Opps. Anyway, I’m not sure what that has to do with anything except that I was struck by this while I was writing this post and I wanted to share. Obviously, today’s fairy printable paper doll is a long time coming. You don’t see a lot of curvy fairies in this world and I think that’s a little sad. Curvy girls can be fairies, too. Afro-puffs inspired the fairy printable paper doll’s hair. My love of afro-puffs is well documented on this blog and continues apace. Along with not seeing a lot of curvy fairies, you don’t see a lot of fairies with natural hairstyles either. I almost gave her more natural brown skin as well, but then I was like, she’s still a fantasy creature. Plus I have an odd fondness for blue skin. If you’re not sure about the blue skin, than there’s a lilac version over on my Patreon page. It’s open the public so anyone can view it. My patrons got to see it on Saturday. Meanwhile, let me know. Do the B&B girls need more fairies in 2018? And if not, what else would you like to see? After I finished the Elements dresses for the Sorceress Gowns Project I wasn’t sure what to draw next. The elements made a lot of sense to me, but then I was like… What other sorts of gown themes can I explore? However, as autumn has come to Alabama and with it there are lots of leaves turning, I decided an series on the seasons would be a fun thing to work on next. 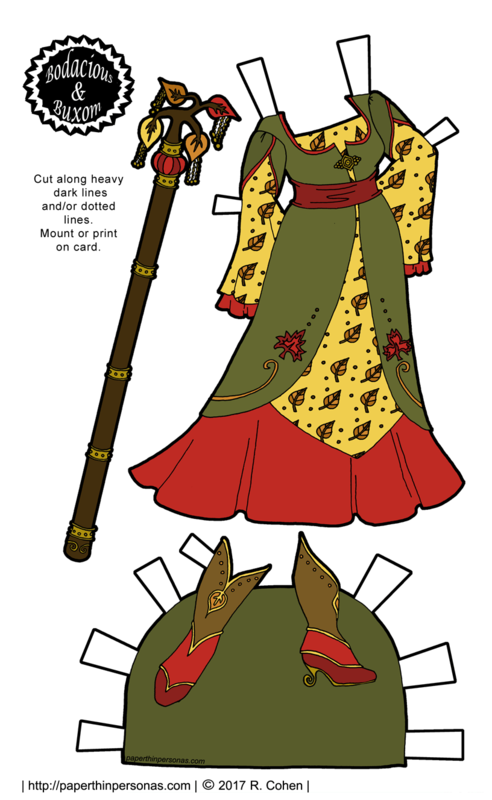 So, today’s Sorceress Gowns Project paper doll outfit is based on the themes and colors of autumn. I wanted to use colors that I see in the hills around town these days. The rich reds and yellows of turning leaves. I chose to do several different leaf designs. The staff was inspired by a tree branch, though I’m not sure it entirely works. And like all the Sorceress Gowns, she has some pretty cool boots. 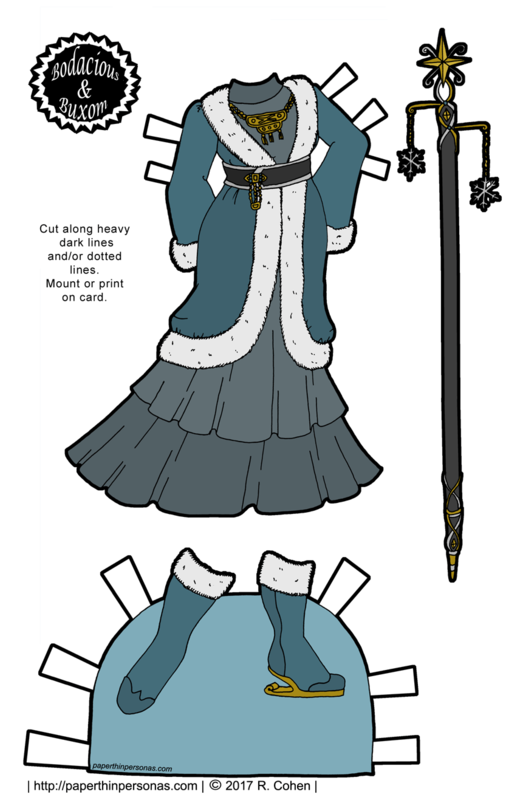 I haven’t drawn winter, spring or summer yet, so this might end up the lone gown, but I plan on them. I just haven’t decided what I want them to look like quite yet. I’ve been working on thumbnail sketches for those dresses. I think I have a decent idea of what they might look like. Of course, I tend to change my mind a lot, so it is also totally possible that I will before I do the final dresses. Meanwhile, Friday there will be a super fun Sprites fantasy set. 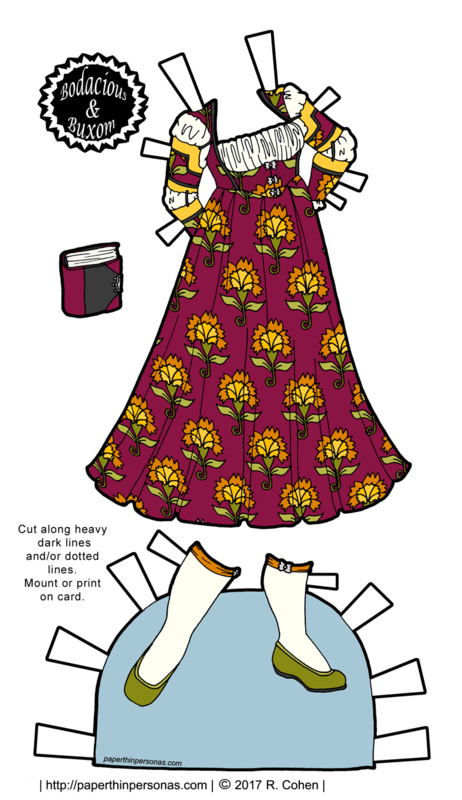 As always, let me know what you think of today’s paper doll gown in a comment. I adore hearing from you all. Sure, there’s a dress with today’s paper doll set, but really I wanted to draw boots. Because I love boots. The dress, well, it’s there because I thought I needed something more than just boots. It’s a nice dress and very in style. Right now, the trend is for dramatic sleeves, so there’s a lot of bellsleeves and ruffle sleeves like this one being shown. Sleeves are very much the latest thing. Personally, I like bellsleeves, so I don’t mind this trend at all. Anyway, I wanted a simple dress, because I really wanted the focus to be on the boots. While I no longer create “sets” in the traditional sense, I do still really believe in playablity. It’s critical to me that each paper doll series function as a collection. 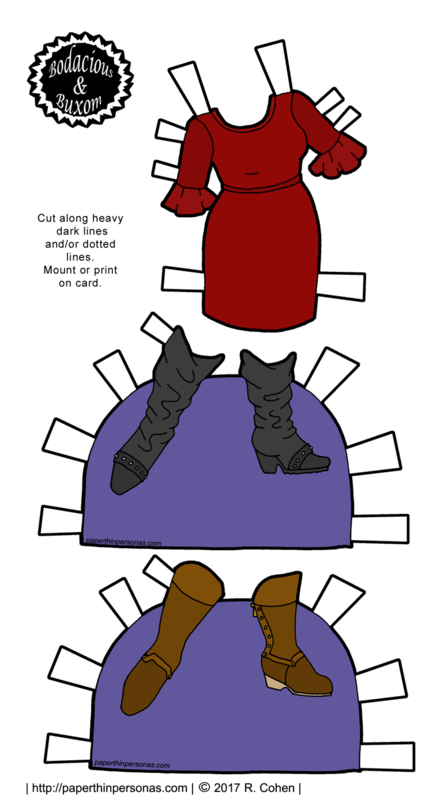 So, while you can look at this as one dress and two pairs of boots, it is also a set that expands on the other contemporary fashion pieces that are available for my curvy B&B paper dolls. If I were to coordinate it, I would use this set, this set and this set, and this set to start. I have a few more trendy fashion sets for the B&B series in the words. (Also, more for the Sorceress Gowns collection, never fear fantasy fans.) I jump around a lot I know, but that’s just because I am interested in so many things. I can’t imagine spending my time creating only one sort of paper doll. I think it would become very boring. Like the blog? Think about donating and becoming a Patron, leaving a comment, and/or telling a friend about it. Confession time: I didn’t keep really good notes on this princess gown- I think of it as one even though there is no crown. I usually try to write down where an idea comes from or what images I look at as source material, but in this case, I really don’t have much of an answer. I know I wanted to do something renaissance inspired and fantasy gown, but with a very different aesthetic than the Sorceress Gowns Project. I think of the Sorceress gowns as being all about layers and flow. This gown, on the other hand, is very much a renaissance inspired gown, though it’s not historically accurate in anyway. And I love, love, love the colors. The colors were inspired by a sunset, but I really wanted to embrace the idea of rich yellows, oranges and greens. The cream blouse and socks are meant to counter the rich color scheme of the rest of the dress. The garters are orange, of course, to march the flowers. I trimmed everything in black to counter balance the bright yellow and orange. Playing with color is such a fun part of creating paper doll fashions. 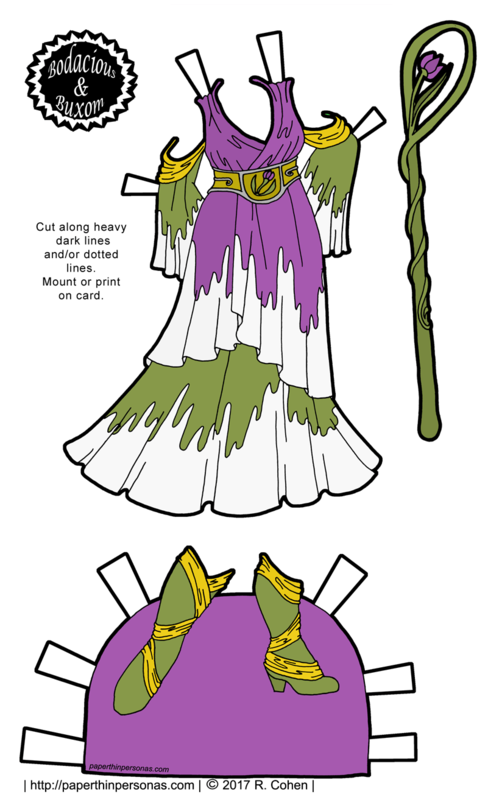 A new paper doll for the B&B Sorceress Gowns Project! Back in April I asked my Patrons what I could do for an ongoing series and they voted on sorceress gowns. So, my goal with the with the Sorceress Gowns Project was to create a series of gowns for a sorceress. That’s probably obvious. I also thought I should make a few dolls to wear the gowns. So, I designed this one to go with my last one from April. There are plenty of B&B dolls that fit with the theme from before April of this year. I think this doll, this doll, and this doll both have a sorceress feel to them. I thought about doing another over the top hair style as I did with last doll to go with the gowns. But I decided that the simple long hair was a nice counter-balance to the complex gown. I had a lot of fun coloring the gown in these muted spring time colors. There’s something very spring feeling to me to this gown. I think it’s the light colors combined with the floral motif that gets me feeling that way. Of course, she needs gowns to be a sorceress. There are four gowns so far, one for each elements. You can see them all here under the Sorceress Gowns Project tag. I do try to organize these things somewhat. It’s my natural librarian tendencies. As always, I hope you’ve enjoyed the paper dolls this week and I always love to hear what you think, so leave a comment if you like. I play a fair bit of Pathfinder. It’s a d20 based RPG which has so much in common with Dungeons and Dragons 3.5 that people joking refer to it as Dungeons and Dragons 3.75. I started playing when I moved to Alabama, because it was a way to meet new people. When you start out as a first level character, you get an outfit of clothing. The book is pretty vague on what this clothing actually consists of, but I was thinking about it recently. I always try to decide how my characters dress, because clothing is a physical manifestation of their social and cultural values. 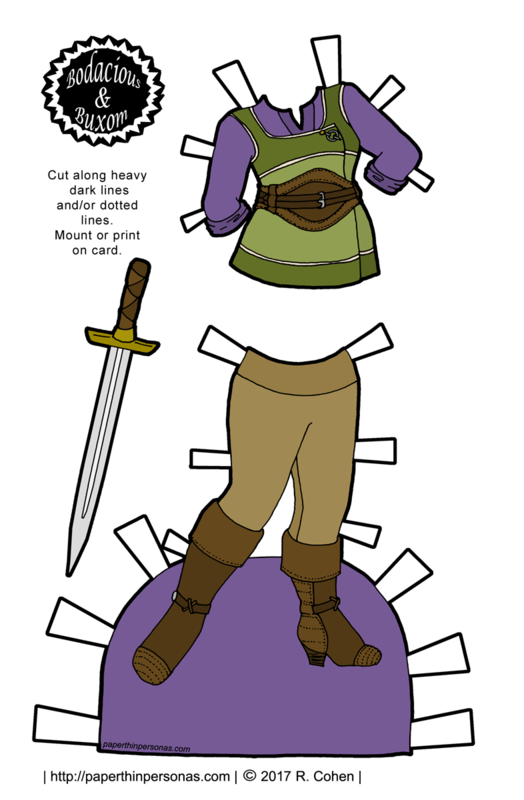 Today’s paper doll is my version of what a beginning adventurer might wear. This isn’t someone who can really afford a super nice set of armor yet and they’re still kinda just figuring things out. So, we’ve got a tunic with a vest over it, a bit of armor, leggings and boots. There’s no lavish decorations. I figure any good adventurer probably has some famous sword to carry around, so she’s got one too. Maybe it’s magical? Anyway, I hope everyone has a wonderful Friday. Next week, there will be a whole week of Mini-Maiden paper dolls.